Publisher/Developer: Cryptic studios, Atari, Inc. 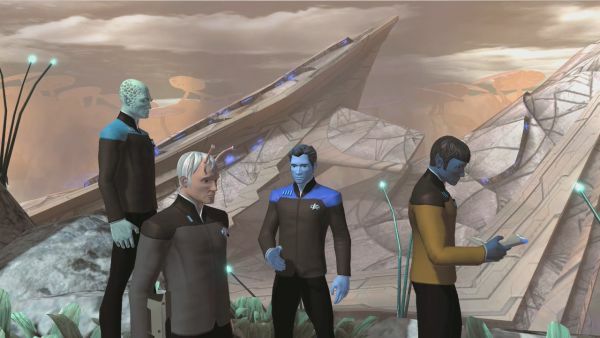 When we first started up the game I was filled in on the timeline; Star Trek Online takes place in the year 2409, or 30 years past Star Trek Nemesis. 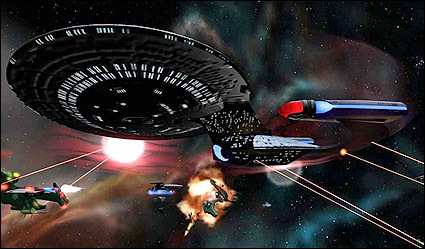 In the game you will play as either Klingon or Federation as they're on the verge of all-out war along the Neutral Zone, though your crew can be made up of just about any race. Everyone gets to be the Starship captain in this game, so you'll be able to live out that fantasy if that's where you stand. The gameplay will alternate between ship based gameplay, where your crew dictates how well the ship does in battle based on their stats and abilities, and ground based gameplay. The ground based gameplay was the most interesting to me, because it played the most like an MMO. During certain missions of the game you're sent with an away team to check out surface activity on nearby planets. Your away team can be up to 4 friends (making up a 5-man/alien/woman away team) or any open spots will be filled out by someones crew members. The crew members were another interesting aspect of the game. While in the ship mode, you will level up your crew members, dictate their specialties and powers, and those powers will go toward the overall workings of your ship. Oh the other hand, as the away team scouts the planet, each person has their own away team kit. A science officer may have a medical triquarter, whereas the Captain may bring some of the big guns. The combat for each type of gameplay was incredibly different as well. With the ships, you're in the big Starfleet vessel - not exactly quick maneuvering, but if you strategically plan your fight, you'll come out on top. With the ground combat it's more direct confrontations for the battles, a bit more exploring, and a lot of shooting Klingons. Now for the grand finale: Full customization. Who hasn't dreamed of making their very own Starfleet vessel that matches their own unique style? Star Trek Online gives you the option to change out the impulse engines, the texture on the ship, the way your ship looks and feels - from what I could tell, the possibilities were endless. This also goes for the crew as well. Customize your First Mate, pick 3 science officers, add any color suit to any character (just don't pick red), use any of the available Star Trek races or mix and match to create your own. Trekkies and softcore Trek fans should enjoy this universe quite a bit. Of all of the full scale MMO's I've ever seen, this has been the most intriguing to me by far. Page created in 0.5304 seconds.